Over 15+ years ago, I purchased a Jarvis .22 long rifle (LR) conversion unit for a 1911 frame. The unit never worked correctly so I purchased a Ciener unit, which has always functioned flawlessly. I decided I wanted to see if I could make the Jarvis unit function reliably, so I dug it out of the box where I had it stored and went to work. Apparently, somewhere along the way I had broken the ejector, which you can see in the photo. The ejector fit into a slot milled in the side of the barrel. Just above that slot was another slot milled for the steel slide. The ejector was just floating in that slot. Jarvis no longer manufactures this unit, but has given manufacturing rights to Tactical Solutions. I called Tactical Solutions and spoke with Dave who agreed to send me a couple of replacement ejectors. In the mean time, I wanted to perform some work on the unit to make it function more reliably. I also want to try to fabricate a new ejector, and modify the design of the unit a little bit. If my modifications didn’t work I could always go back to the original design. Polish the slide rails so it slides effortlessly on the frame. All of my 1911s are hand fitted so this slide fits tightly on any of the frames I have. Mill a 1/16” hole vertically in the barrel to accept a roll pin. Fabricate a new ejector out of tool steel. Pin the new ejector in place. Tune the recoil spring so it functions correctly. I put adjustable sights on it long ago, so this won’t have to be done. I put the slide on the frame I planned to use and found there was a high spot on the frame rails where the ejector was mounted. I could still move the slide, but the high spot caused it to bind. I completely disassembled the frame and put some Mothers® Mag & Aluminum polish on the rails at the point of the high spot. This is a very fine grit polish so it’s not so aggressive. I realize this will also remove some metal from the frame, but it shouldn’t be enough to matter. I briskly moved the slide back and forth on the frame to polish down the high spot so the slide moved freely. After about 20 cycles, I put more polish on the rails. I polished until the slide moved freely on the rails. I cleaned the frame and slide with brake parts cleaner, then lubricated with Break-Free CLP. I mounted the assembled conversion unit on the frame and test-fired one round. The slide cycled completely and cocked the hammer. Of course, with no ejector, the shell casing stayed on the extractor, and was fed back into the chamber when the slide moved forward. I wanted to be able to pin the new ejector into the barrel. If this modification didn’t work I could always use the floating ejector. My Ciener conversion unit has the ejector staked in a slot milled in the side of the barrel, but I didn’t think I had enough metal between the ejector slot and slide rail slot to be able to stake it on both sides. Also, staking is a more permanent installation, which I didn’t want. The above photo shows a 1/16” drill bit in the approximate position where I planned to mill the hole. I wanted to get as close to the inside of the slide rail slot as possible without breaking through. Since the ejector slot is deeper than the slide rail slot, this should be the mid-point of the ejector, and leave plenty of clearance for the chamber and bore. With the new ejector pressed against the inside of the ejector slot and pinned in place, it should not move. First, I milled a 1/8” flat on the bottom of the barrel at the point I planned to mill the 1/16” hole. This made sure the 1/16” milling bit started flat and didn’t wander, and made it easier to start a roll pin. Then I took a 1/16” square end bit and plunged a hole to the depth of the bit. Because the bit was too short to go completely through the barrel, I finished the hole with a 1/16” drill bit. I measured the thickness of the broken ejector and it came to a bit over 0.046”, which was probably 3/64” (0.046875). I went to Online Metals and purchased a piece of 01 tool steel 18” x 1/2” x 3/64”. At its widest point, the ejector measured a little less than 1/4” so I should have more than enough stock to fabricate ejectors and make mistakes. I carefully measured the original ejector so I could fabricate a new one. In the above diagram, the two vertical lines at 0.413” and 0.513” are where I will need to bend the ejector so the hook will contact the case head, yet not rub against the bottom of the slide. Note: Even though I used a CNC mill, you can fabricate an ejector using files, but it takes a lot longer. I used my CAD program to create a diagram of two ejectors. The 1/2“ tool steel stock allows me to cut out two ejectors side by side. I put the blank in my hobby CNC mill and cut out the two new ejectors. I didn’t have the depth set properly on my program so there was some flashing left around the ejector. I removed the flashing and broke the sharp edges with a jeweler’s file. I marked the ejector with a blue marker and scribed lines where I needed to put the bends. 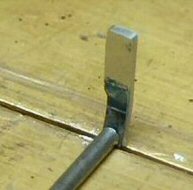 I put the ejector in my vise up to the top line and carefully bent it by hitting it with a small steel punch at the point it stuck up above the vise jaws. I lifted the ejector out to the next line, and bent it the other way. In the above photo, you can clearly see one of the scribe lines. I installed the ejector in the slot in the barrel and marked where to drill the 1/16” hole. I removed the ejector, drilled the hole, then pinned the ejector in the barrel to test for fit. The ejector fit tightly in the barrel slot, and it fit into the slide and frame. I removed the new ejector, hung it from a paper clip, and heated it with a propane torch until it glowed bright red. I then dropped it into a cup of motor oil to quench it. This hardened it so it will last a long time. After quenching the ejector, I reinstalled it in the barrel. In the left photo, you can see the roll-pin hole and the new ejector pinned in place. Also, notice the slight bend that allows the ejector to contact the case rim. The barrel fits onto the slide and moves with nothing binding. The entire unit fits on my 1911 frame, and again, cycles with nothing binding. I tested the new ejector with an empty case and a loaded round just to see if it would eject, and it does. I also tested with my Ciener magazine, and loaded rounds fed and ejected. I took the unit to the range, and in the 15+ years since I purchased it, it finally functioned flawlessly. Using my Ciener magazine, it would feed rounds only if the slide was moving at full speed. If I tried to feed a round slowly, it would pop up out of the magazine and the nose of the round would hang up on the top edge of the chamber. Wow, this is both fun, and cheap to shoot! Well, I am very pleased with my installation/modification. The 3/64” x 1/2“ x 18” piece of tool steel cost $10.00 plus $7.00 shipping. I can get 10 or more ejectors out of that piece, which comes to $1.70 each, which is about what Tactical Solutions charged me for a new floating ejector. Fixed installation – you don’t have to worry about getting the ejector aligned properly, which is one reason the floating ejector can be broken. To me, this project represented true gunsmithing. Rather than just replace a part, I modified a design and fabricated a new part. Only time and frequent use will tell just how durable, and sensible, was my modification. I received the replacement ejector from Tactical Solutions, and just like the original, it did not fit. This was the original problem all along. So, my modification worked and did improve the functionality and reliability of the unit.